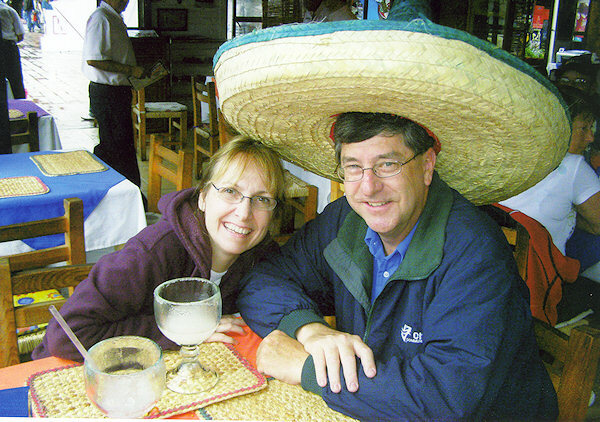 During the first week of February 2010 we sailed on the Carnival Splendor to Puerto Vallarta, Mazatlan, and Cabo San Lucas. 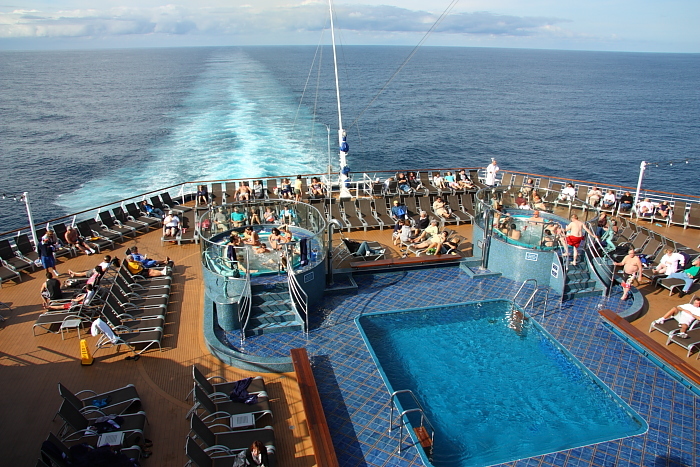 This was our sixth cruise with Carnival and our seventh cruise overall. 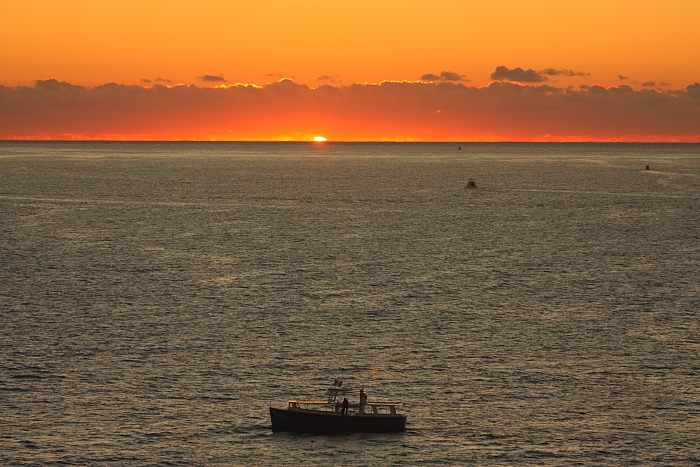 The quick summary of our cruise: very enjoyable! One of the two best cruises we've been on, so far. 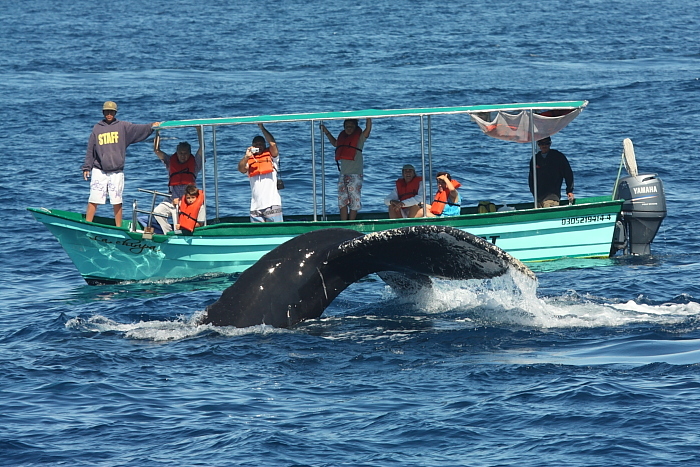 My top three favorite things during this cruise were: the "behind the fun" tour of all the areas of the ship that passengers don't normally see... a wonderful whale watching excursion out of Cabo San Lucas, where there were LOTS of whales and where we were able to get extremely close to them... and a nice relaxing beach excursion in Mazatlan, featuring unlimited free drinks and a nice Mexican lunch. 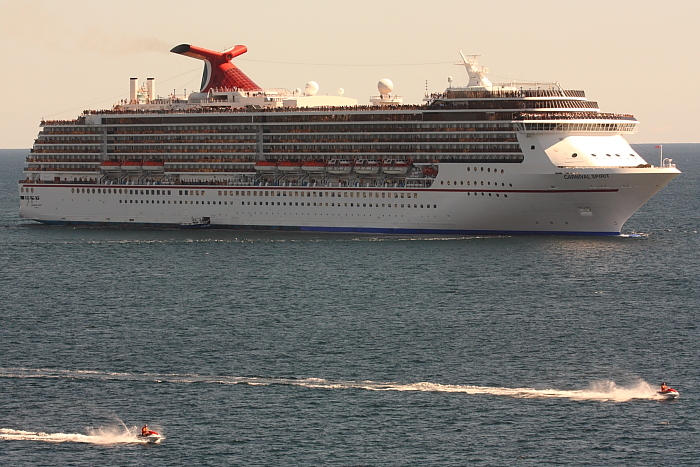 My best photo of the Carnival Splendor... docked in Mazatlan, Mexico. The back of the boat is a popular area for people to hang out. The weather was a bit cool on this particular day, so the hot tubs were more popular than the pool. It's for adults only, so there are no screaming kids... and it's also the only freshwater pool. The other two are filled with ocean water. 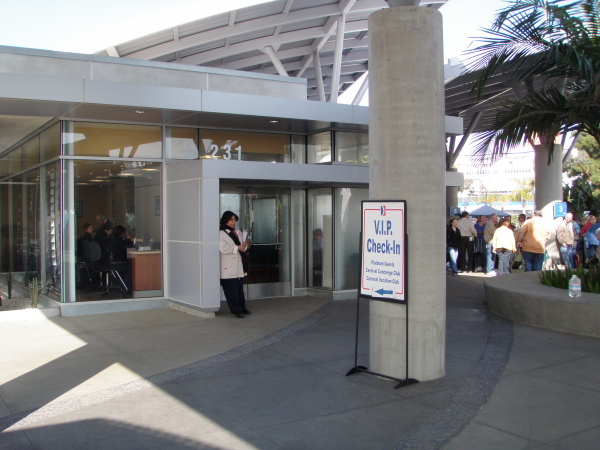 Here's a look at the lobby. 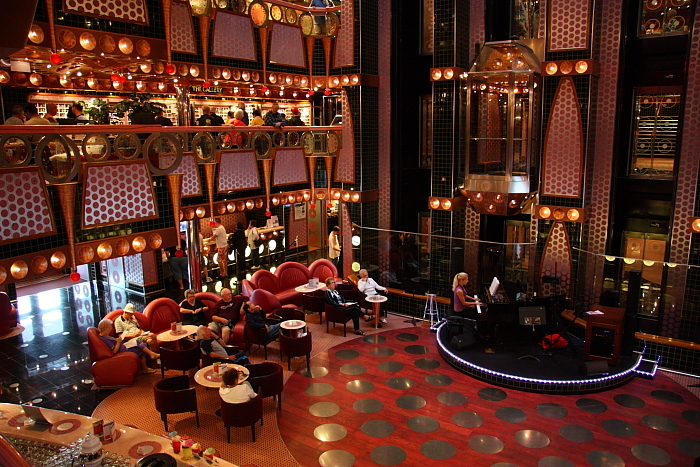 Prior to the cruise, I had seen a lot of photos on the Internet of the unusual "pink circle" decor used in some of the public areas of the Splendor. From the photos I had seen, it looked horribly over-the-top. But in person, it didn't bother me as much as I thought it would. Yes, it was a bad design choice by Carnival's Interior Designer, but it's easily forgotten during the fun of your cruise. This pool and hot tub are next to the big waterslide... so they tend to be full of children. 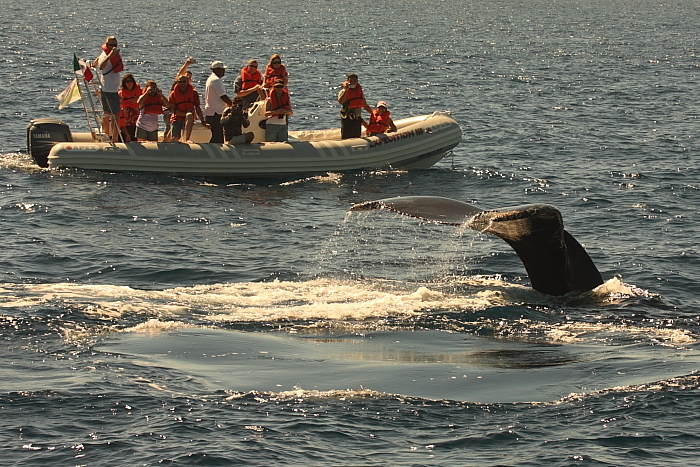 The closer we got to Puerto Vallarta, the more wildlife we saw in the water. 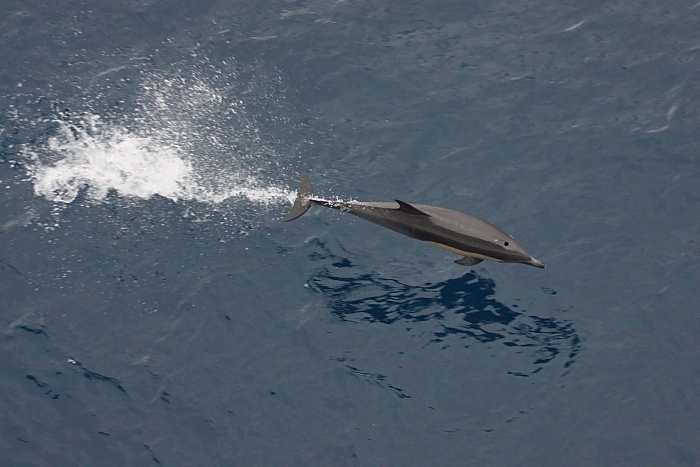 I shot this photo of a dolphin swimming alongside the ship, from the balcony of our cabin. 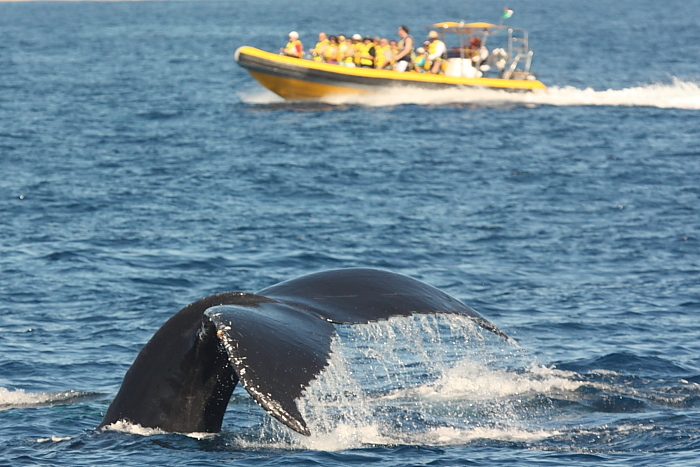 There was a pod of about 50 of them, and they loved to try to keep up with the ship's speed! 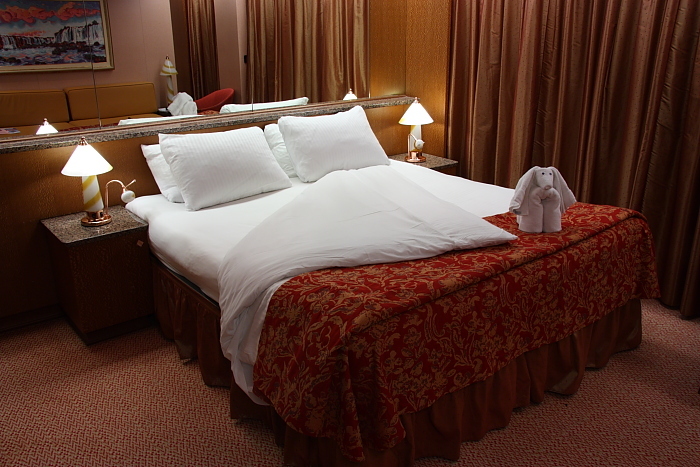 For our seventh cruise, we decided to splurge... so we stayed in a suite. 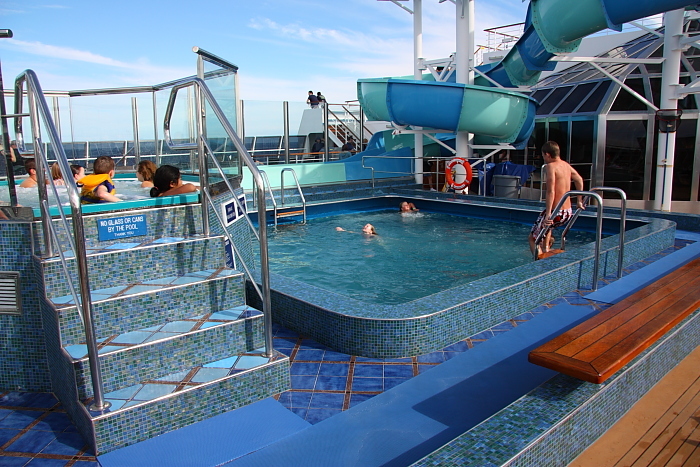 It was definitely larger and nicer than any of the cabins of our previous cruises. There was even a whirlpool bath tub, and a dressing room. The decor was elegant and peaceful. and by the end of the cruise we had a pretty good collection! and got us on the ship quite a bit sooner than almost all of the other passengers. One of the perks of staying in a suite is V.I.P. status. This means you get priority over the masses when getting on or off the ship. Passengers with physical disabilities are the first on and off... but the VIPs are next. This is really great at debarkation, as it means you can get to your car (or to your flight at the airport) a lot sooner than the other people. It's also really nice to be one of the first ones onboard, as you can get lunch at the buffet and have your choice of tables by the windows before the big crowds arrive. We had never stayed in a suite before, so we were very curious about whether we would end up thinking it was worth the extra money or not. We really did like the suite... the extra room inside as well as the extra room on the balcony was much appreciated. There was more storage space, and more room in the bathroom. Two sinks instead of just one... and the dressing room was much appreciated. My favorite thing about the suite was actually the V.I.P. status, though! I really did like being among the first on and off the ship. However, in the end our verdict was that it was not actually worth the additional money that the suite cost compared to a normal balcony cabin. We long ago decided that inside cabins and ocean-view cabins were not to our liking... we love having the balcony. So now we know that it's not worth it (in our opinion) to get a suite... so we'll be sticking with balcony cabins for all of our future cruises. This is a good thing to know, as I hope there will be MANY future cruises! I'm a fairly casual person, so on formal night this is as dressed-up as I was willing to get. you can see that the decks were not tremendously crowded. Of the seven classes of Carnival ships, my wife and I have now sailed on four of the seven. The Splendor was the largest ship (by far) that we had sailed on. 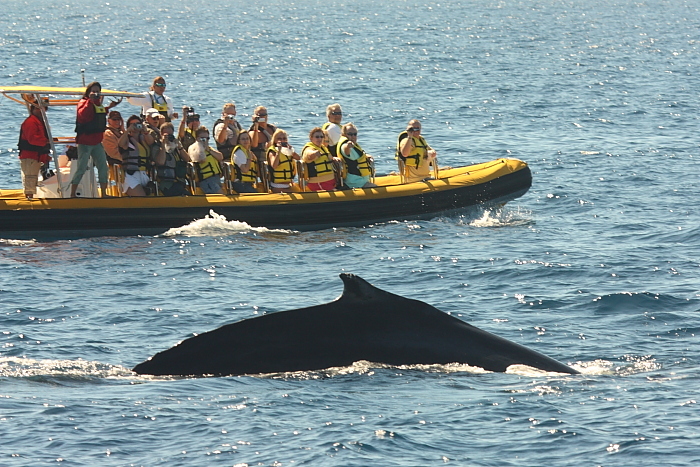 One of the things I was really curious about in sailing on a ship this large was whether it would seem crowded. 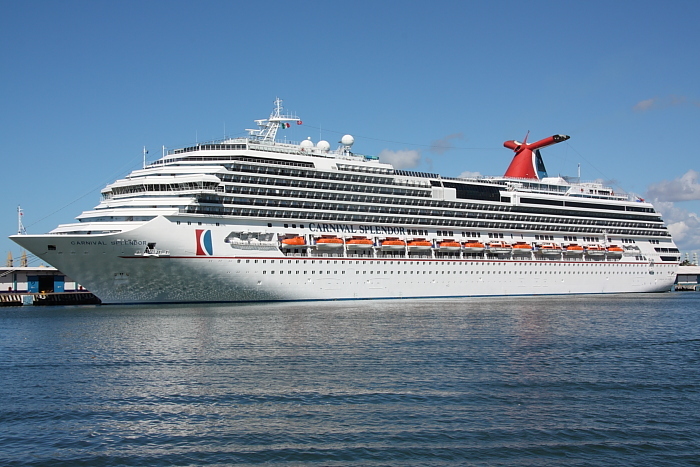 The Splendor carries about 900 more passengers than Carnival's Spirit-class vessels. Would it be a problem competing with 900 additional guests for a seat at a show, or a place in line at the buffet? The answer turned out to be yes and no. The worst crowding was in the casual buffet restaurant on the Lido deck if you made the mistake of going there right during the peak of meal times. For example, if you tried to get breakfast at 7:30 AM or lunch at 12:30 PM. Go a little bit off-peak, and there's no problem. You'll need to think ahead if you want to get a good seat in the big theatre for one of the Vegas-style shows, or any kind of seat at one of the comedy shows in the smaller and more intimate El Morocco lounge. If the show starts at 8 PM, don't just breeze in there at 7:57 expecting to get a good seat. It just doesn't work that way on a ship with so many passengers. If a great seat up close to the stage is what you want, get there a good 30 minutes early, or more... and then just relax and have a nice conversation with your companion while you wait for the show to start. To be completely honest, I have to say that of the four classes of Carnival ships I have sailed on, my favorite is actually the Spirit class. The Carnival Spirit seemed less crowded, which makes sense since it is only a slightly smaller vessel yet it carries 900 fewer passengers. Yet the Spirit-class vessels have almost all of the best features of the newer ships. The biggest thing they don't have is the jumbo-sized television out by the pool. 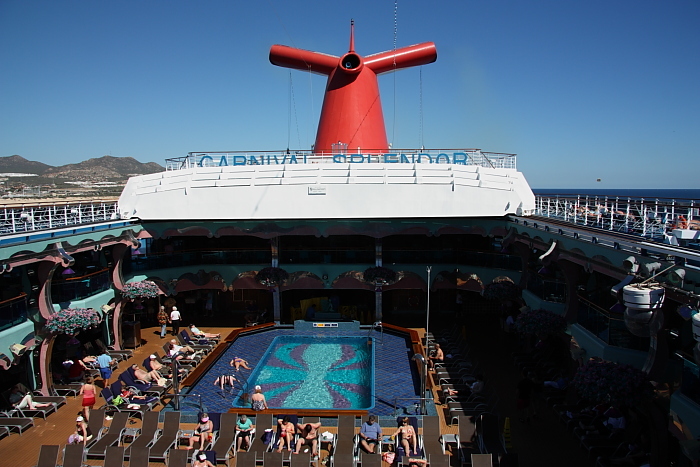 But as someone spoiled by a really nice 50" plasma TV at home, I have to say that I found the big poolside TV on the Carnival Splendor to be a bit of a disappointment! The quality of the picture was just nowhere near as good as what I'm used to at home. It reminded me of sports stadium TV quality from the 1980s. 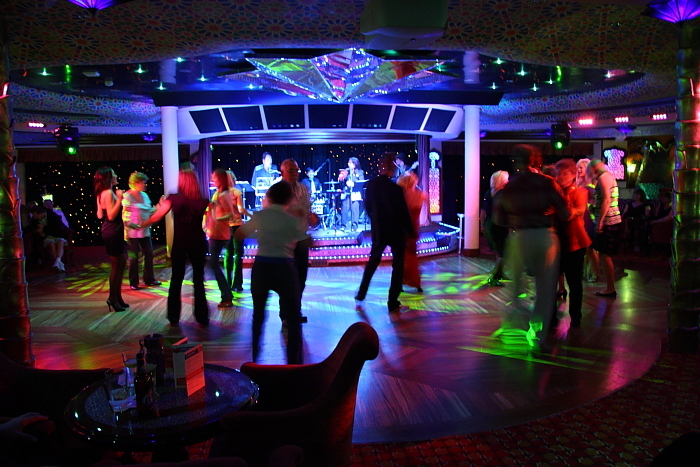 One of my favorite places onboard was the El Morroco show lounge. Here you can see people dancing to music from a fairly good band. We also saw a very good stand-up comic here one night. 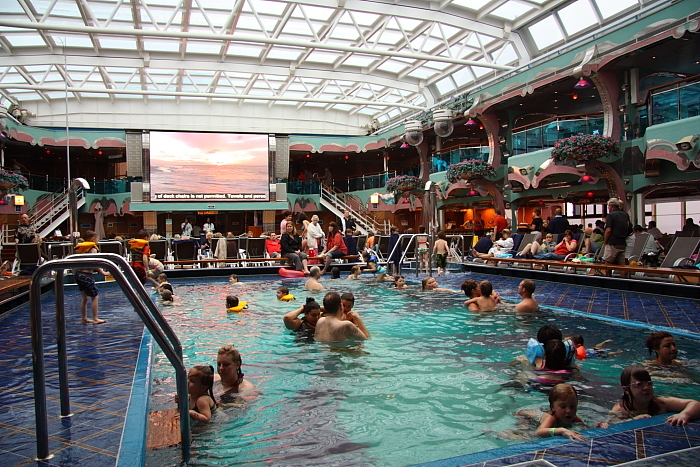 The Carnival Splendor had several innovations I had not seen on other Carnival ships. 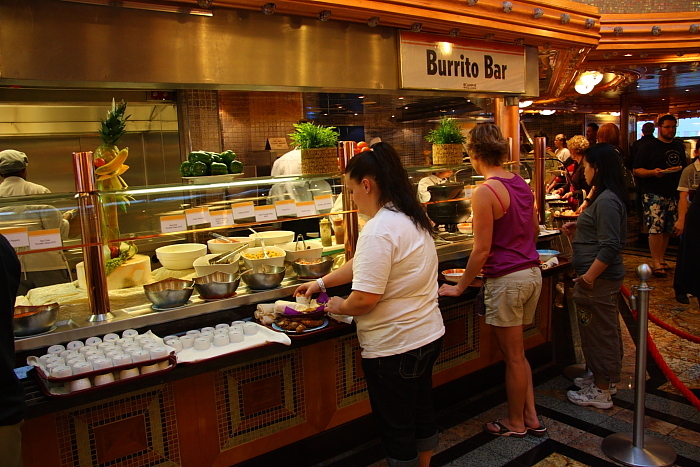 One of my favorites was the burrito bar at lunch time. However, you can get a much better burrito at just about any restaurant in Southern California. You just can't expect great Mexican food on a cruise ship with a primarily European and Asian staff. There's always something fun happening onboard! 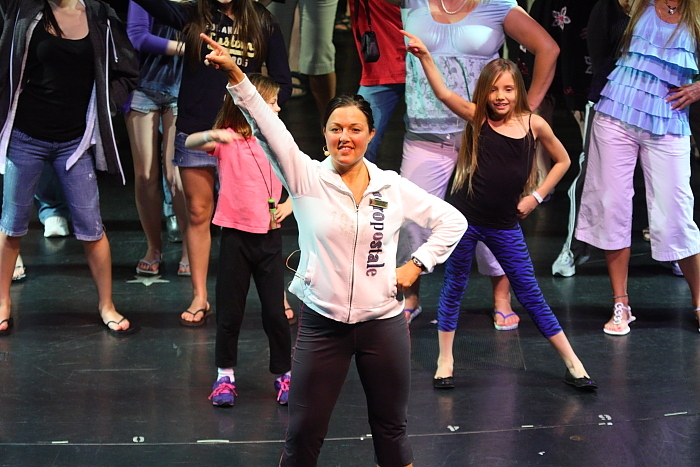 Here is our Cruise Director, Stephanie Meads, leading a dance class to the Abba song "Dancing Queen"
I laughed on the first night of the cruise when the Cruise Director announced (to much applause) that it would be 88 degrees in Puerto Vallarta. I had been checking the weather forecasts every day before the cruise, and her prediction did not match what I had read! 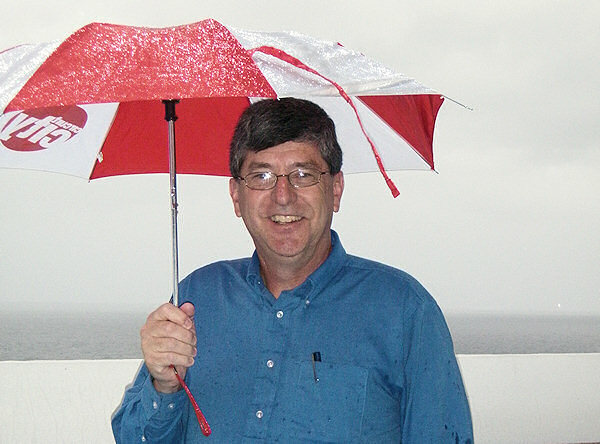 I was one of a very small number of people that brought along an umbrella, and on the third day of the cruise it came in handy. It didn't just rain a little that day... it poured! a dome that can slide closed to protect the pool area during inclement weather. With fairly heavy rain falling outside, it was nearly perfect under the dome. An excellent heating system keeps the entire area nice and warm, too. But... if the weather's yucky outside, EVERYONE wants to be under the dome! So, it gets a bit loud and crowded in there during inclement weather. 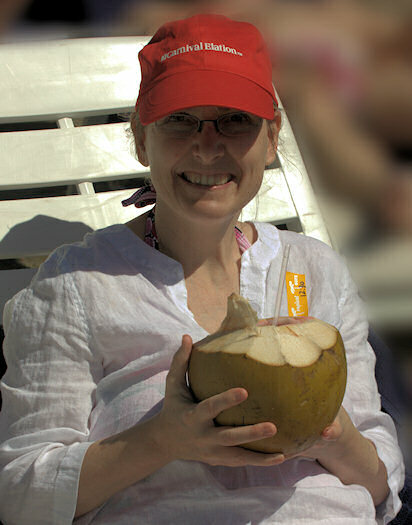 a tropical drink served in an actual hollowed-out coconut. but on Stone Island in Mazatlan they serve the real thing! and a few early-risers got to enjoy a spectacular sunrise. 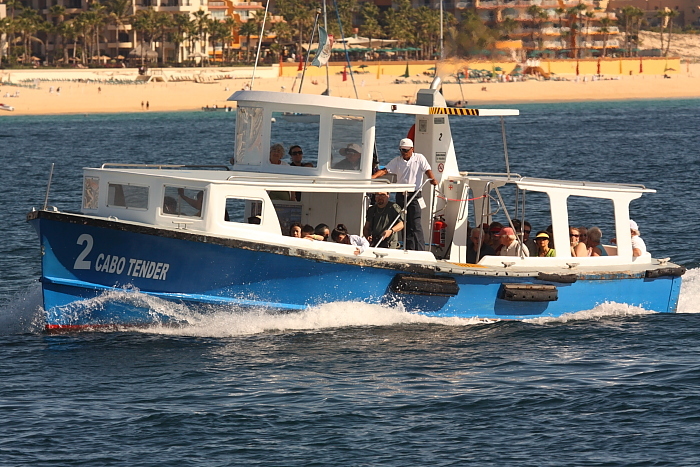 so they use these "tenders" to take you from the ship to the marina. 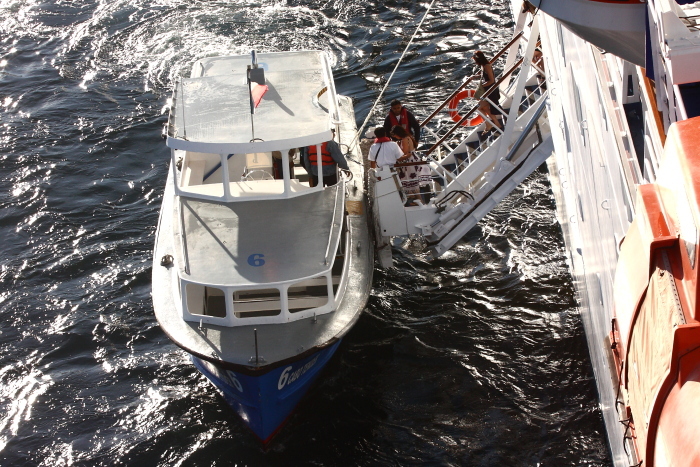 This photo shows the process of getting on to the tender from the cruise ship. It can be a little tricky, because the ocean swells move the tender up and down and in and out. 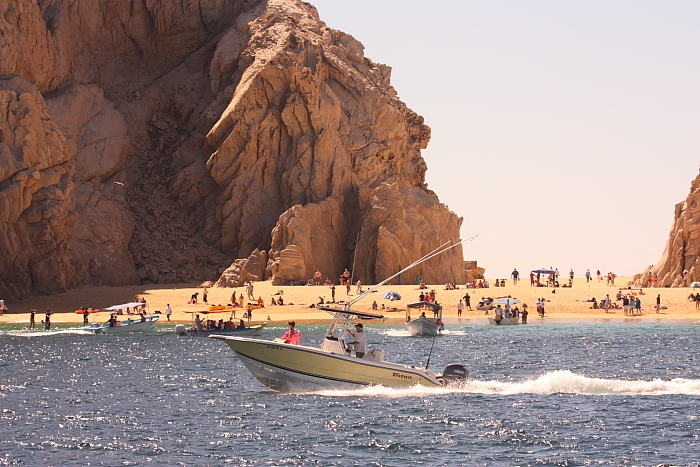 One of the most popular tourist spots in Cabo San Lucas is "Lover's Beach". The only way to get there is by water taxi... a fancy term for "small boat for hire". 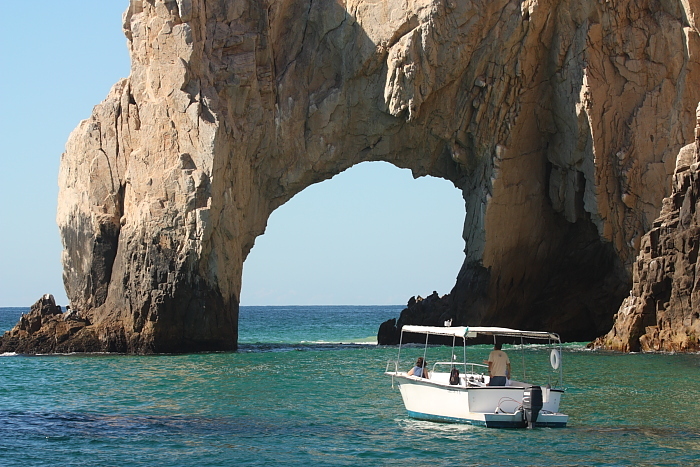 The iconic landmark at the far southern end of Baja California is Los Arcos (The Arches). 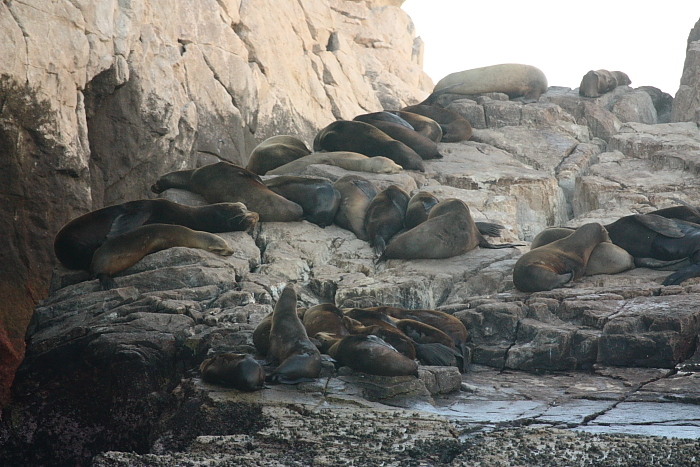 This seal colony was near Lover's Beach and Los Arcos. 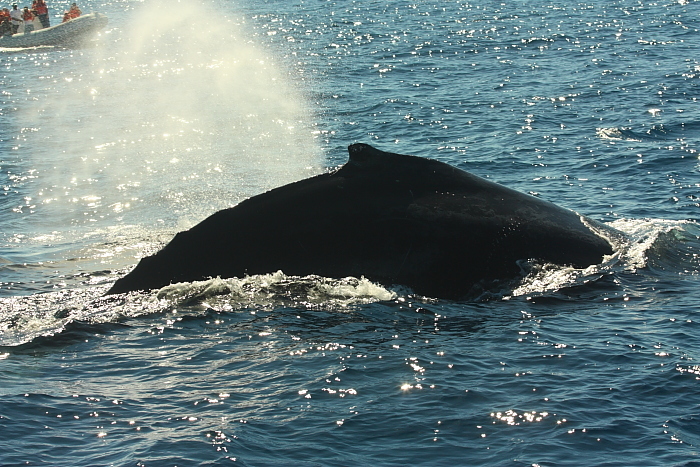 From a whale watching boat, we were treated to this view of the Carnival Splendor. 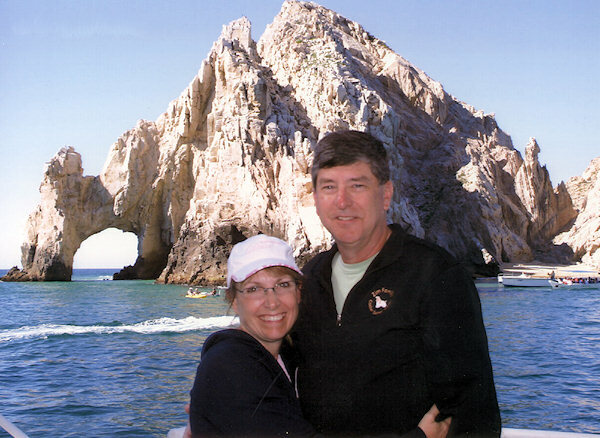 On a beautiful sunny day off Cabo San Lucas, the dome over the pool was open. We had some very nice meals in the Gold Pearl dining room. 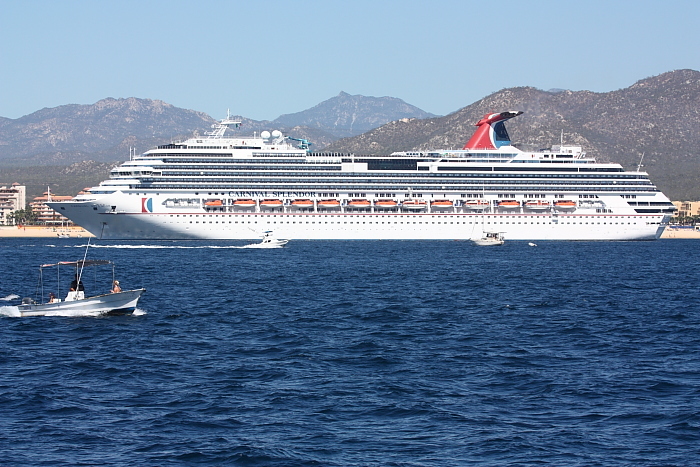 While our ship, the Carnival Splendor, lay at anchor just off Cabo San Lucas, I was surprised to see a second Carnival ship, the Carnival Spirit, arrive in the area. At first I assumed they were making a regularly scheduled visit to Cabo just like we were. But after a few minutes, I realized that something unusual was happening. While hundreds of passengers lined every available viewing spot on the decks, a single Cabo tender pulled up next to the Carnival Spirit. 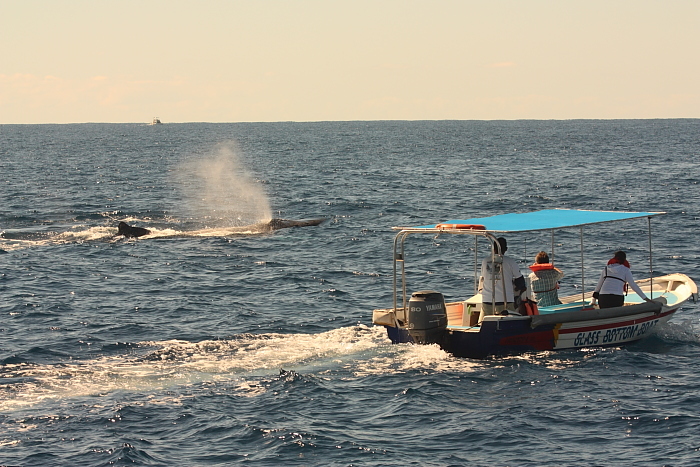 After a few minutes, the tender pulled away and headed to the Cabo marina, and then the Carnival Spirit fired up her engines and headed north. It all happened in a matter of a few minutes. It turned out that what we had witnessed was a medical evacuation of a sick or injured passenger who needed more medical care than could be offered on the ship. A medical evacuation underway on the Carnival Spirit. The true highlight of the cruise for me was when I got to be part of the "Behind The Fun" tour... which is a 3-hour tour of all sorts of interesting parts of the ship that passengers don't normally get to see. For example, I got to visit the bridge as well as the engine control room... two places that have generally been off-limits to passengers since 9/11. Because it is limited to a very small number of people, the "Behind The Fun" isn't promoted much by Carnival... most people learn about it via word-of-mouth, or from web sites such as CruiseCritic, or from the blog of John Heald, the Senior Cruise Director for Carnival. 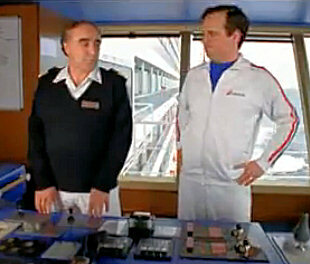 I got a kick out of talking to Captain Pagano, as he was the star of my favorite Carnival TV commercial. In fact, the very first thing I said to him upon being introduced was "aren't you the one from the TV commercials?" I think he liked being recognized for that, as he immediately launched in to about a four minute recollection of what is was like to make those commercials... and he really seemed to enjoy talking about it. Captain Pagano was also the guy at the helm when the Carnival Splendor was involved in an accident while docking in Puerto Vallarta, and I just couldn't resist the urge to ask him about it. I didn't want to seem disrespectful in asking about what I'm sure was one of the darker days in his career, but I really wanted to hear the story from his perspective. I have to admit, though, that I was worried he would be offended by the question... maybe he would tell me to "get out" of the bridge like he told the guy in the commercial! Captain Pagano was actually very gracious and spent some time giving his perspective on why accidents like that happen quite frequently in the industry. He didn't use these exact words, but the gist of what he told me was that it's hard to maneuver a cruise ship in tight quarters. If it was easy, they wouldn't need highly trained captains. Imagine how much trouble you have parallel parking a car. Now imagine parallel parking a football field. I also specifically asked if he got in any trouble for the accident, and he said he did not. It was an amazing privilege to be able to talk to him about it! By the way, Captain Pagano also co-starred in my second-favorite Carnival TV commercial... a clever little ad they ran when the Splendor was the newest ship in the Carnival fleet. 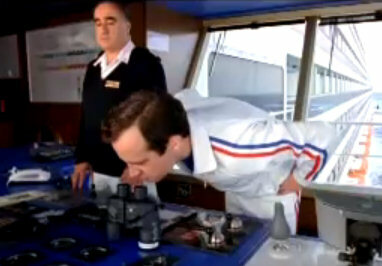 The guy in the ad was fascinated with the "new ship smell" of the Carnival Splendor. So, when we cruised on the Splendor, I made a lot of jokes to my wife about the "new ship smell". She thought it was funny the first few times, but I think I may have used the joke a few too many times by the end of our cruise! And while I'm pointing out interesting YouTube cruise clips to you... I have to share this one that was made when the Carnival Splendor was brand new and had just left the ship yard for its first few cruises. The clip features Carnival's Senior Cruise Director, John Heald, showing you a small design problem in one of the Spendor's public restrooms. During our cruise, I tried to use as many public restrooms as possible, hoping to find the one in the funny YouTube clip with John Heald, and after much searching I finally did find it. Of course, the little problem had long since been fixed, but I could still see the holes in the walls where the hand dryer used to be mounted. But I have gotten sidetracked in my story about the Behind-The-Fun tour and my visit to the bridge, haven't I? 1. A real sailor considers Azipods to be something of a gimmick. A good captain doesn't need them, and a real ship doesn't have them. 2. There have been reliability issues with Azipods. A standard propulsion system doesn't have as many maintenance issues. 3. Azipods are expensive. It's cheaper to build a ship with a standard propulsion system. Another highlight of the "behind the fun" tour was a visit to the engine control room. I work in a nuclear power plant, and my son has worked at several television stations, so I am no stranger to high-tech control rooms. But the engine control room of the Carnival Splendor really impressed me! Keep in mind that the Splendor first entered service in 2008... so it's got all the latest technology. It's way more high-tech than a nuclear power plant... as most of those were designed in the 1970s. I enjoyed talking to the ship's Chief Engineer, Antonino Messina, in the engine control room. It was obvious in talking to him that he is highly educated and extremely knowledgeable. However, there was just a tiny bit of a language barrier. While he does speak English very well, it became obvious to me that he didn't completely understand a question I asked him. He had been talking about how when the ship gets close to California, it has to (by law) switch to a low-sulfur diesel fuel that creates less air pollution. Outside of a certain distance from California, the ship runs on normal diesel fuel, which creates a very black smoke and soot. I asked him why they did not simply use the low-sulfur diesel all the time? What was it about the low-sulfur fuel that made it unsuitable for use during the entire voyage? He misunderstood the question slightly, and thought I was asking about why they used low-sulfur diesel... which was something he had already explained. So he explained it again. Finally, I re-worded my question, and he understood it correctly. The answer was simply the cost. He said that normal diesel fuel costs about half as much as the low-sulfur diesel fuel. But the fact that he missed the exact meaning of my original question got me to wondering what language they normally use among the officers on the ship. I could see where they might use English, as that seems to be the universal language among most of the very international crew. But perhaps they use Italian, as that seems to be the native language of almost all of the officers. I really wished I had asked them about that, but I didn't think of it until later! 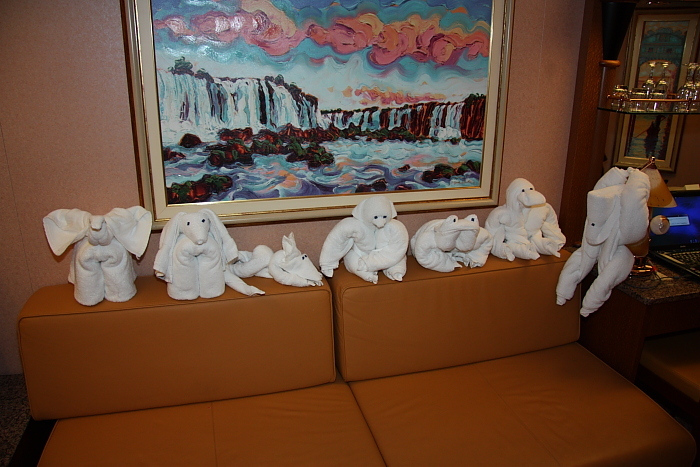 But there are a few things someone should clue you in on before your first cruise! For example, did you know that there are only two electrical outlets in each cabin? (And one of them is in the bathroom, way up high where it is hard to get to.) If you are bringing several electrical devices with you, be sure to bring a 6-outlet power strip. For example, this will allow you to charge the batteries on your digital camera, cell phone, and laptop computer overnight. >A watch or a travel clock. Activities start at certain times, so you will frequently want to know the current time. Each day of the cruise, they publish a little newsletter that tells you information about what will be happening on the ship that day. It's called "Carnival Capers". If you've never cruised before, you'll find looking at a copy of Carnival Capers to be a great way to see the kinds of activities available onboard the ship. I've scanned the Carnival Capers from each day of my cruise. All are in .pdf format. Half of the fun of being on a cruise ship is all that food! 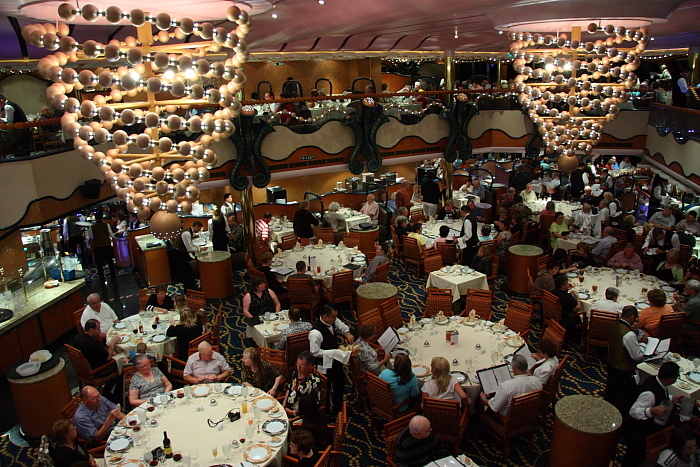 If the food isn't good, the cruise won't be good... as we found out on Norwegian Cruise Lines a couple of years ago! You might be wondering what they serve for dinner in the main restaurant of a Carnival cruise ship. If so, these scanned copies of the menus will be of interest to you. 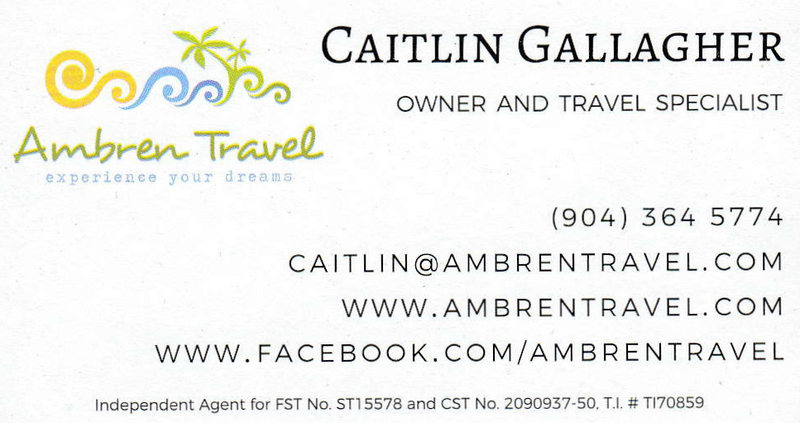 All are in .pdf format. Please be aware that Carnival changes their menus approximately every two months. So, unless you are cruising in February or March of 2010, these menus will be somewhat different from the ones on your cruise. On the morning of November 8, 2010, while sailing from Long Beach to Puerto Vallarta, a fire broke out in the aft generator room of the Carnival Splendor. No one was injured, but the damage was so severe that it left the ship dead in the water. There were over 4,400 passengers and crew members onboard at the time. 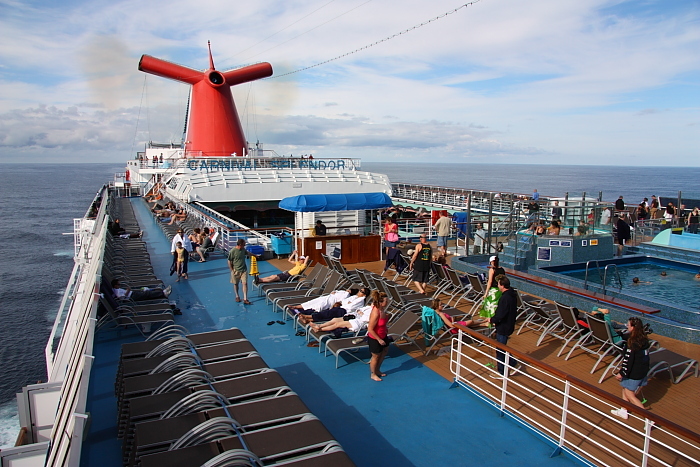 I was not on board the Carnival Splendor at the time, but I wasn't very far away! My wife and I were actually sailing on the Carnival Spirit, and we were anchored in Zihuatanejo Bay on the day of the Splendor fire. 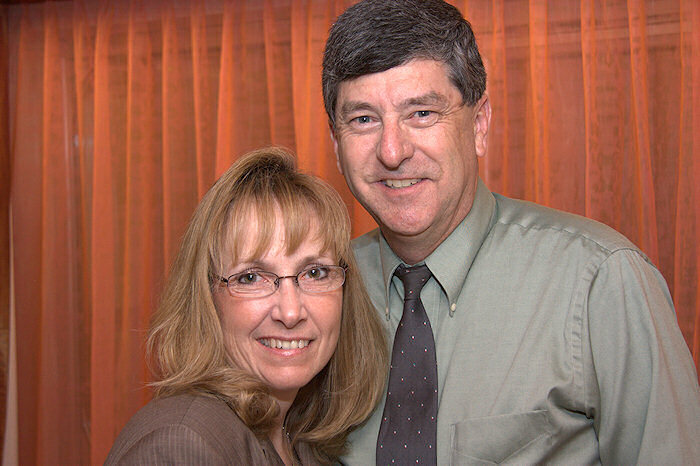 We learned of the fire when our son, Jeff, who was working as a news producer for San Diego's KFMB-TV, contacted us via cell phone to inquire what Carnival ship we were on. News of the fire onboard the Splendor had just broke, and he wanted to see if that was the ship we were on. It was sure a stroke of luck that we chose to cruise the Spirit that week and not the Splendor! I had considered both cruises, but picked the Spirit since I had been on both ships before and liked the longer itinerary and less-crowded atmosphere of the Spirit. Instead of a relaxing vacation, it sure would have been an unpleasant week for us if we had booked the Splendor that week instead of the Spirit! I did notice one thing that was a little bit unusual on the Carnival Spirit the day after the fire on the Splendor... all the network TV stations that are normally available on the cabin televisions mysteriously went away that day. My theory is that someone in a position of authority on the Spirit decided that it would be bad for the passengers to find out about the fire that had occurred on the Splendor... and ordered a blackout of all TV stations that might broadcast news of what had happened. By the next day, though, they must have given up on any hope of keeping a lid on the news... because all the TV stations became available on the cabin TVs again. Of course, the Splendor fire was big news... and it wasn't long before the word got around and everyone on the Spirit was talking about it. Wouldn't it be cool to hear a first-hand account of what was happening on the bridge of the Carnival Splendor during the fire and in those difficult days that followed? 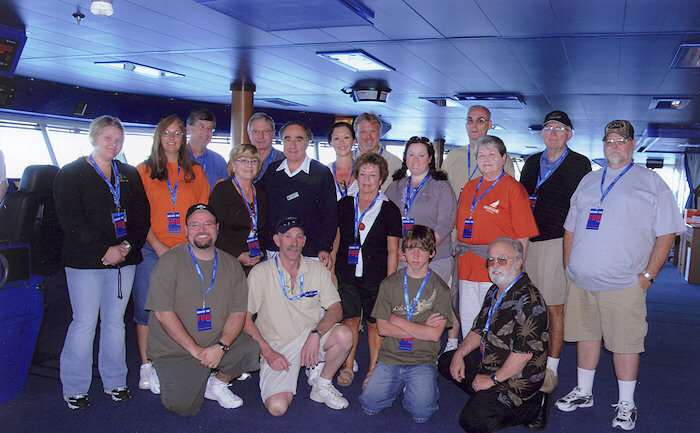 Well, as luck would have it, Carnival's Senior Cruise Director, John Heald, was the Cruise Director of the Splendor that week... and he has discussed the incident in detail on his blog. Fascinating reading! His story is told six parts: part 1, part 2, part 3, part 4, part 5, and part 6. But do remember that John Heald knows who butters his bread, so he isn't going to say anything to make Carnival look bad. For that, you have to read this article... and be sure to follow the link in the very first sentence of the article, which will lead you to part 1 and part 2 of the U.S. Coast Guard advisories that were issued after they investigated what happened on the Splendor. The ill-fated Splendor cruise with the fire has been dubbed "The Spam Cruise" because of the widely circulated photo showing a pallet of Spam being airlifted to the Splendor by the Coast Guard. But did you know that no spam was ever served by Carnival on that cruise? In scrambling to recover after the fire, Carnival put in a rush food order to their shore side food vendor. One of the food items they ordered was unavailable, and the vendor substituted a pallet of Spam instead. After the Spam was delivered to the Splendor, it was NOT served... as the Food and Beverage manager rejected it as unsuitable for serving to the passengers. Some members of the media are still to this day perpetuating the myth that passengers were served Spam on that cruise... but it just isn't true!